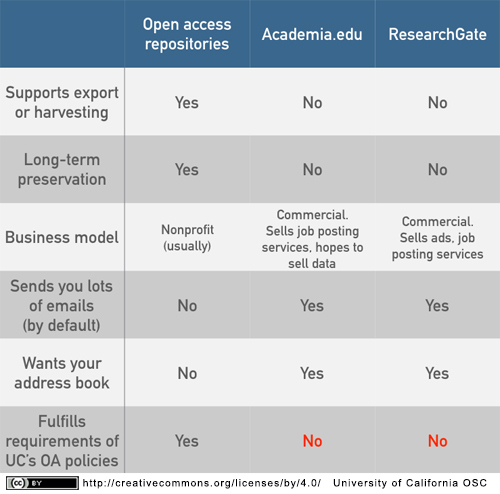 As the University of California Office of Scholarly Communication points out, however, Academia.edu and ResearchGate are not really Open Access repositories: they are social networking sites for academics that use offprints the way Facebook uses pictures of your family—as a way of getting friends and colleagues to come to the site and click around. And ironically—or perhaps not—neither are actually that great at spreading the word about your work. As anybody who has ever got an email from those sites telling you that “3 people have looked at your work” (which means everybody on them), the sites hide as much information about the use of your work as they reveal. If you’ve ever tried to add a paper from either to your bibliography using their DOI or other form of citation harvesting, you’ll also know that their bibliographic standards leave a lot to be desired. And finally, none of them promise any kind of long-term preservation: the terms and conditions of both sites allow the owners to remove your work without notice for any reason. So what to do if you really want to get your work out there, but in a permanent, responsible, and citable fashion? harvestable (assuming they are using some of the standard solutions) and all the rest. you have to belong to an institution—many of the people who need to show off their work the most (i.e. those looking for work or finishing up graduate degrees) do not have easy or consistent access to one. Another solution is FigShare, which is a commercial pre-print server but one that largely answers the issues raised by the UC Office of Scholarly Communication. A third solution, however, is Zenodo. This is a data repository established by the EU at Cern, but open to all. It takes most data sets (including PDFs and, interestingly, Github repositories) and gives everything a DOI. And you can organise deposits by creating communities. This feature allows you to do things like publish journals (e.g. our graduate student journal). Or supplement journal articles and books with datasets. But it also allows you to publish a personal, long term (Zenodo is promised to exist at least as long as CERN does) Personal repository (here’s mine). Put articles up to Zenodo and then you get a DOI and a URL that you can put in your CV. If you put your bibliographic information in carefully, it can be harvested by citation managers very easily. And it is indexed by Google Scholar.